* Two youths (15 & 16) have been arrested for the Alma College fire. Read this Globe and Mail article for details. A fire that started just after 12:00 p.m. on Wednesday quickly engulfed Alma College, reducing the former girls’ school to little more than an empty shell of its former glory. Smoke was visible as far north as downtown London and as far south as Port Stanley. 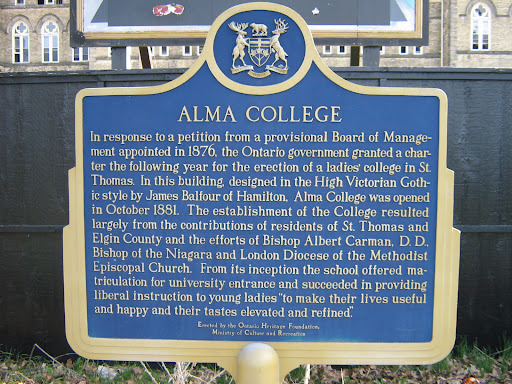 The timing of the fire came less than two weeks after the Ontario Municipal Board (OMB) agreed to the combined City of St. Thomas and George Zubick (Alma’s owner) request to demolish Alma College. Early Thursday morning, Constable Anders Nielsen said “with the help of the Fire Marshal’s Office, we have determined that it is arson.” Alma College is now a crime scene. Ironically, at the same time that fire fighters were battling the blaze in St. Thomas, petitions to save Alma College were being delivered to Ontario’s Legislative Assembly in Toronto. Elgin-London-Middlesex MPP Steve Peters took time from the afternoon question period to lament the passing of this historical treasure. I need to seek the indulgence of the House for a moment. I recognize that I’m probably out of order and I can’t rule myself out of order, but I lost a really good friend today, and it was a heritage building. Alma College was a historic school in my community that towered over the city. I could see it from my backyard and from my office every day. Tragically, it burned to the ground at noon this afternoon. I trust that if it was arson, they will find the culprits. For me, Alma was a special place. First, it was incorporated by this very chamber in its beginning, and it stood as a monument for a long time. I worked at that college 20 years ago when I was a university student. It was a special thing to have a girls’ school and being the only guy that could walk through the front gates of that school and not be arrested. I say this because there have been community citizens for over 20 years who have actively tried to find a new use for the building. And in over 20 years, we’ve had various governments. I needed to make the statement for myself and to say thank you to the people over the years who worked so hard to preserve this building. I just ask that we remember that. I hope it’s a lesson to all of us that our heritage is precious and that we need to collectively do what we can to ensure that we preserve our heritage for future generations. Once these buildings are gone, they’re gone. You can’t ever bring them back. If nothing else, I hope that this fire today at Alma College-that all the work everyone has done over the years hasn’t been in vain, that we can learn collectively that it’s incumbent on all of us to make sure that we stand up and preserve our heritage and find ways of developing new and unique partnerships to make sure that these symbols will remain for generations to come. I thank the members for allowing me this opportunity. Peters’ official statement is posted in the comments section below. There was a morning event at Alma College by high school students protesting the OMB’s decision. Sarah Miller of the Facebook group Eerie and Endangered: Celebrating the Beauty of Alma College has posted several photos of the fire. This last photo was taken by Melissa Ravenek and posted on the Facebook group Remembering Alma College. Nothing now remains of Alma College save its chapel and a pile of rubble. The St. Thomas Times-Journal has posted a comprehensive series of photographs documenting the fire. Mike Whitman produced an excellent video tribute to Alma College. The Alma College fire was picked up by the Canadian Press and Sun Media. Stories and photos were published in the Timmins Daily Press, the North Bay Nugget, the Sarnia Observer, the St. Catharines Observer, the Woodstock Sentinel-Review, the Edmonton Sun, CBC’s National, the Toronto Star and the Globe and Mail. For more information on Alma College click here. This is a list of news articles on the school. To read the OMB’s May 16, 2008 decision click here. I’ll be updating this post as more information becomes available. In the meantime, have your say and comment below. It is certainly a sad day. It definately is convenient for this to happen now…especially what all of us are trying to do with saving it. I think we should now fight for them to rebuild what we lost. Get the building plans from City Hall or where ever they are and rebuild what was there. I couldnt believe it !! At first all I could think of was ALL the people in st.thomas that have been fighting SO hard to keep this beautiful place still standing. It made me so upset. But then all I could feel was anger. The fact that someone would do that to such an amazing place makes me sick. Our Ontario government did absolutly nothing to save this place.. I hope one day they realize what they just lost ! I find it difficult to put into words my extreme sadness regarding the fire that claimed Alma College today. We have forever lost an architectural treasure that served as one of the true reflections of what the City of St. Thomas is all about to residents, visitors and friends across the globe who were touched by the building’s majesty. My direct connection to Alma College started before I became Mayor when I served as its archivist. I have remained vigilant throughout the years through its many tumultuous times and fought for its preservation for generations to come. It is beyond irony that today I met with senior staff of the Premier’s Office to bring their direct attention to the status of Alma College and to appeal to the Premier and Culture Minister Aileen Carroll to invoke the 50-day stop order in regards to the pending demolition permit and to seriously consider granting Alma College provincial heritage designation. A staff member of mine at the scene has learned that the Fire Marshall has attended the site and has started an investigation that may take three or four days. I have also been told the site is to be secured during this time and the remaining structure will eventually come down for safety concerns. I believe a police investigation has also begun. To reiterate, it is truly a sad day for the heritage of St. Thomas and the entire province and I am heartbroken on behalf of everyone who loved and fought for Alma College. I was truly saddened yesterday to see the huge plume of black smoke over St Thomas … signalling the demise of the grand lady, Alma College. My husband and I were married in the chapel on the Alma grounds in 1991. The chapel and the school were such beautiful buildings. Sadly I saw some photos on line today showing the chapel in recent years — stained glass windows broken, pews gone, carpeting ripped out – sadly I think the heart of Alma was gone long before the fire took her physical presence. My heart aches and I have left disgusted with our municipal’s lack of interest in preserving our history. They simply throw up their hands and do nothing. I am truly heartbroken and disgusted. I am an old Alma Girl and have known Steve Peters for decades. He had a genuine affection for Alma College. When he said he was heartbroken, I truly believe him. We are all so sad to see what has happened. It is a good wake up call for all of us to ramp up the legislation in this area. It seems nobody has learned anything from the Alma College saga. I put my heart and soul into trying to save that building and even now, four months later, I am still heartbroken and I have an ache inside whenever I think of Alma. And I think of it everyday! The chapel still sits on the grounds of Alma College, nobody has done anything to protect it from the elements. Where do we draw the line? Will it take another fire for people to give the chapel some attention? I for one am sick of the lack of movement and lack of protection for heritage buildings from the provincial government and I sent Aileen Carroll a letter regarding the chapel and the amphitheatre. Let’s see if I get a response?